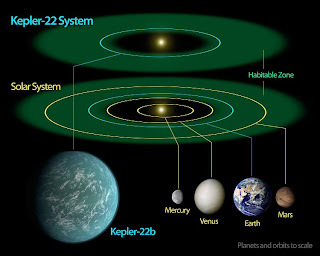 Today's announcement of a discovery from the Kepler telescope is really big news: a planet that orbits in the habitable zone of a star very similar to our own. This planet, though a few times larger than Earth, is the closest thing we have found to something like our own planet. Kepler waits until a planet has been observed passing in front of its parent star three times before confirming this as a discovery, and in 2009 I noted that this means that we would start seeing planets orbiting stars like at our own at distances similar to ours a bit over two years after the start of the mission, which is about how long it has been since it started in May 2009. The press release also notes that the first transit of this planet was observed very soon after the start of the mission, meaning transits two and three took about two more years (the planet has an orbit of 290 days). This also means that in 2012 we will see a veritable bonanza of these types of planets, as Kepler begins to confirm planets with orbits of 300 days, 310 days, 350 days, 400 days, and so on. 2012 promises to be very exciting indeed. 1 - It will be a planet that is similar to our size. Kepler 22-b has this. 2 - It will be a planet that orbits a star similar to our own. Kepler 22 is this kind of star. 3 - It will orbit in the habitable zone of this star. Kepler 22-b has this. 3 - It will be relatively close to us. Kepler 22-b........is 600 light years away. - The psychological impact of a planet a few light years away is completely different from one a few hundred years away. The former distance is technically possible with enough interest and funding, and theoretical projects such as Project Longshot and Project Daedalus explore how it would be done. A planet at such a distance may motivate us to find ways to reach it, while 600 light years away is well beyond us to the extent that we wouldn't even bother thinking about it. - A planet a few light years away is just a few years away by radio. Also, the planet we are looking at is more or less the planet as it currently is, not as it looked six centuries ago. And now for your enjoyment the full press conference announcing the discovery. One hour in length, I still haven't found the time to listen to it today. Also let's not forget another probably exoplanet/star discovery that will change the way we see our universe forever: a brown dwarf star closer to us than Alpha Centauri, assuming there is one or more of them at that distance. Doing so would decrease our isolation (the distance from our system to the nearest one) by a huge factor, and if something were to be found at one or two light years away it would even be reachable with theoretical propulsion (nuclear pulse propulsion) in under a human lifetime. Of course, the easiest way to learn more about these is simply to build better and better telescopes. I am confident that we will see our interest and funding in the next generations of telescopes grow by leaps and bounds in the near future as we acquire more and more targets that we desperately want to know more about.